There's been an awakening indeed. There will be no spoilers in this review so if you have not seen the movie yet, you will be safe. The Star Wars saga returned to the big screen 10 years after the last of the prequels which were commercial successes although not particularly liked by many fans. The Force Awakens was by far the most hyped movie of the year and quite possibly of all time so it faced a lot of pressure to be a huge success. First of all, huge credit has to go to J.J Abrams. He faced a huge task of cramming 30 years worth of story into this movie and does so very well. Even just from the opening scroll, you feel caught up and are immediately ready to go. The franchise welcomed a whole bunch of new faces to the Star Wars cinematic universe and each of them bring their own bit of greatness to the film. Oscar Isaac joins as the best pilot of the Resistance Poe Dameron who's cool demeanour makes him an instant favourite who you will care and want to learn more about. 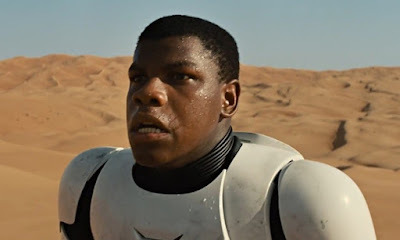 John Boyega brings great comedy to the film as Fin in another likeable role. Our new villain Kylo Ren played by Adam Driver is fantastic. This character was played perfectly by Driver and is one of the stand outs of the film. This performance shows us the character of Kylo Ren incredibly and brings a fresh villain to the franchise. The stand out performance in this whole film is from Daisy Ridley who takes they role of Rey. A new fresh faced hero who will be one for the ages due to her incredible likeability and her ability to hold her own up against the best of them. A hero worthy of bringing the franchise further forward. There isn't a poor performance from any of the newbies as they bring so much more to The Force Awakens. 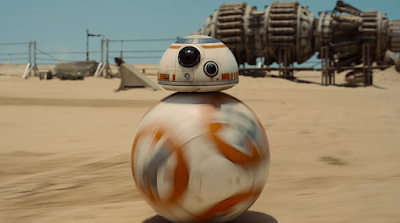 A special mention has to go out to the wonderful creation that is the BB-8. This new droid like none that we have seen before is incredible. This practical droid that simply rolls everywhere has taken up the reigns from R2D2 and C3PO as being the main non living character in the movie. 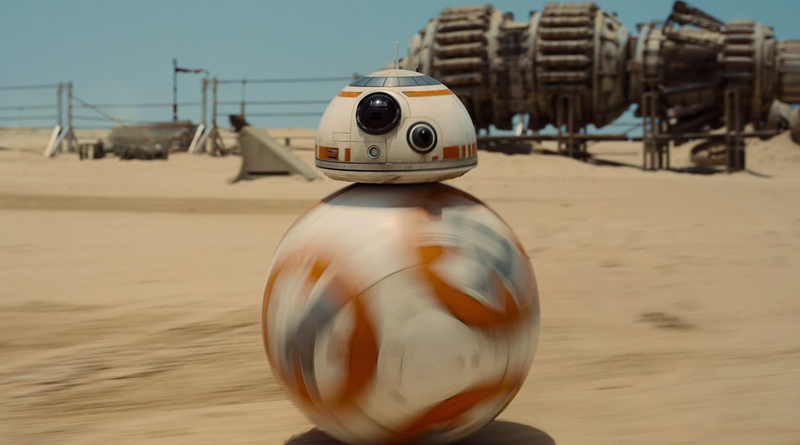 Through the many sounds the BB-8 makes, it clearly shows plenty of emotion either it been sad or happy. It also provides us with many laughs which makes it a great addition to Star Wars. It also leaves us all wishing that we had one as well! 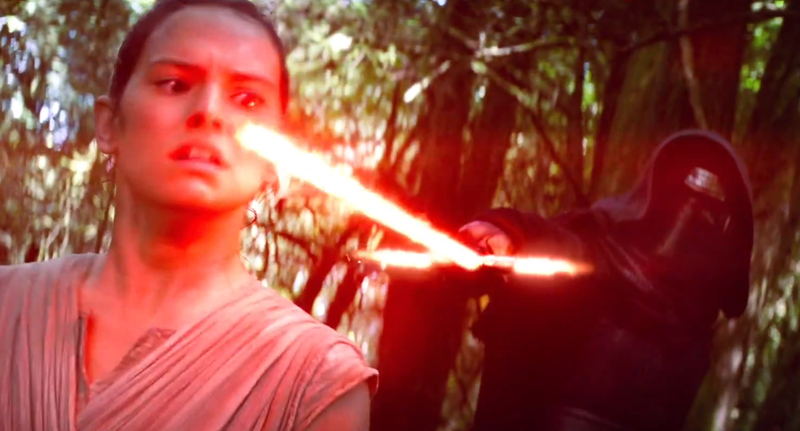 Although the new stars are great, there is still a lot of throwbacks in The Force Awakens. It does not feel overdone though. 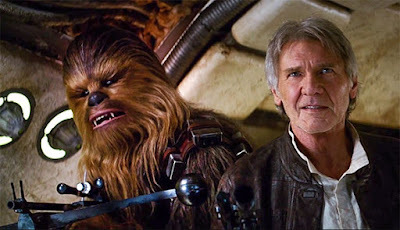 Harrison Ford is back as Han Solo and it was just great seeing him return to role he perfected in the original trilogy. You wouldn't think Harrison Ford was acting in The Force Awakens. Quite simply, he is Han Solo. Carrie Fisher is back as Leia Organa who takes up a lesser role than Han but is still ever as effective. Characters such as C3PO, R2D2 and Admiral Ackbar are back but none play huge roles in the film. Only Han Solo plays a main role through this film of the original cast which is good to see that J.J didn't have to rely heavily on the old characters to take Star Wars further forward. The use of Luke Skywalker in the story for me was more than satisfying but could see why people would've liked to of seen a lot more from him. Don't get me wrong though, The Force Awakens does use a lot of nostalgia throughout the film. However this is done in the right way. From the reveal of the Millennium Falcon to the mask of the deceased Darth Vader, great memories come rushing back. But these are just moments and don't linger on. They are used to an extent but are used very effectively. Many CGI and practical effects are used to bring these old memories back to us and mainly everything looks great. The CGI used to create the larger than life sets in the backgrounds are truly breathtaking and some of the best that you will ever see. There is one scene that involves certain creatures that the CGI does not feel up to the scratch but everything else looks amazing. This is a visually stunning film and it needs to be otherwise it just looks ridiculous and would pull you out of the Star Wars universe. This felt like the old Star Wars. There was no boring meetings. No midichlorians. No gungans. No boring, one dimensional characters. There are shocks. There is great action. There are heartfelt moments. There are laughs. The Force Awakens was a great, fun movie in which Star Wars should be. Probably the most funny Star Wars there has been but it does not get in the way of the story and isn't the main focal point. This is helped mainly due to the charismatic performance given by John Boyega who shows his comedic abilities very well in this role. Overall The Force Awakens is an excellent film. Fans of the franchise will certainly love this as it is a return to the greatness of the originals. There are a few minor problems but the good heavily outweighs the bad. This will be one of the most enjoyable films of the year and I would be lying if I said I didn't love this film. The Star Wars that we know and love is back! Now just until 2017 for Episode VIII. 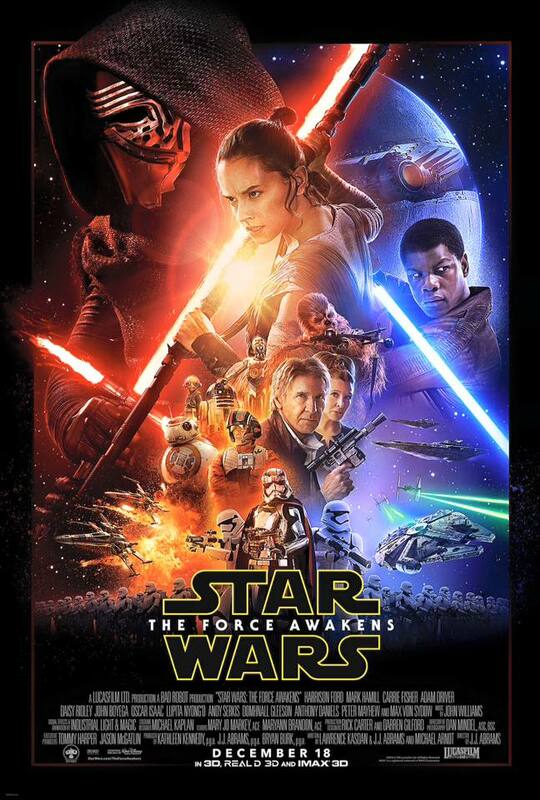 The latest instalment of the Star Wars saga is definitely worth checking out for both fans and newbies to Star Wars. A fun, compelling story which will have you wanting more as soon as the credits hit makes The Force Awakens one of the most entertaining movies of the year.